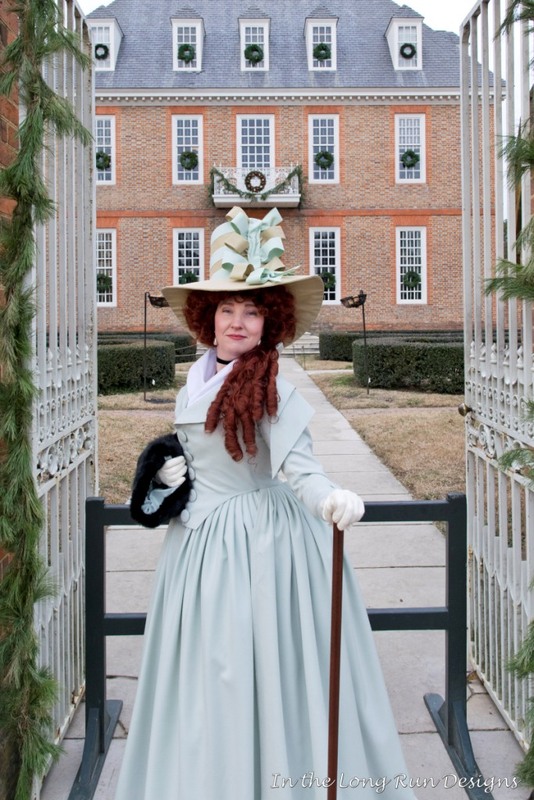 This post focuses on construction of the hat I made to wear with my mint wool 1780s redingote. 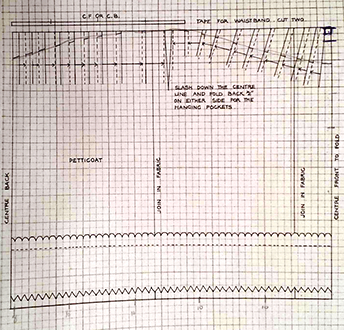 For the post on construction of the redingote itself, click here. I should begin by noting that I have no idea how HA or not the construction of my hat is. We apparently do know that wire and buckram were used in hat making at the time but don’t know how much it would have resembled our modern materials or just how they were used. We don’t have any surviving examples of these hats (that we yet know of) to check against. So please do keep this in mind – this is *my* interpretation of how such hats maybe *could* have been made. As promised, a post outlining the construction of the 1780s mint wool redingote I made at the end of last year. 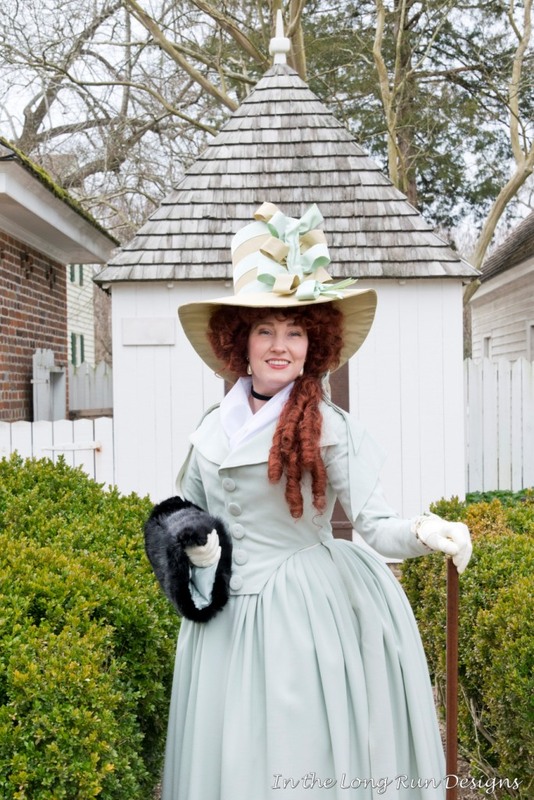 1780s Mint Redingote at a Colonial Williamsburg Weekend! 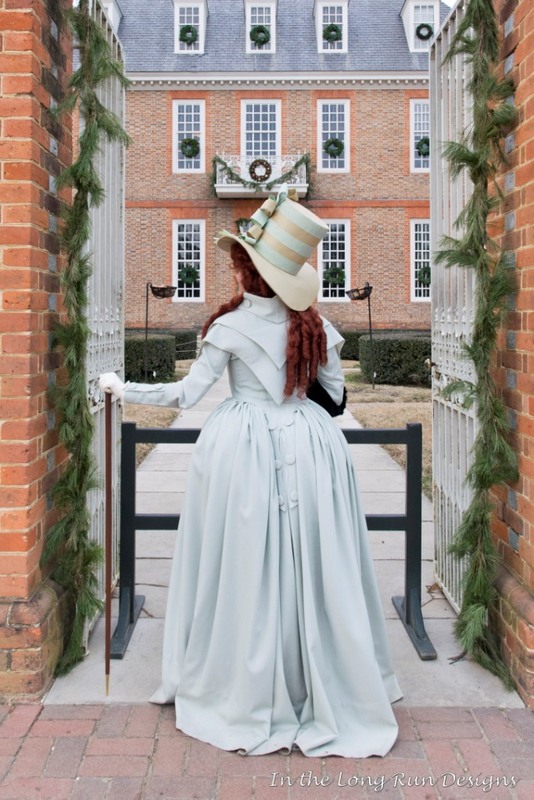 Right at the end of 2017 I had a little dream come true – a costumed weekend at Colonial Williamsburg! 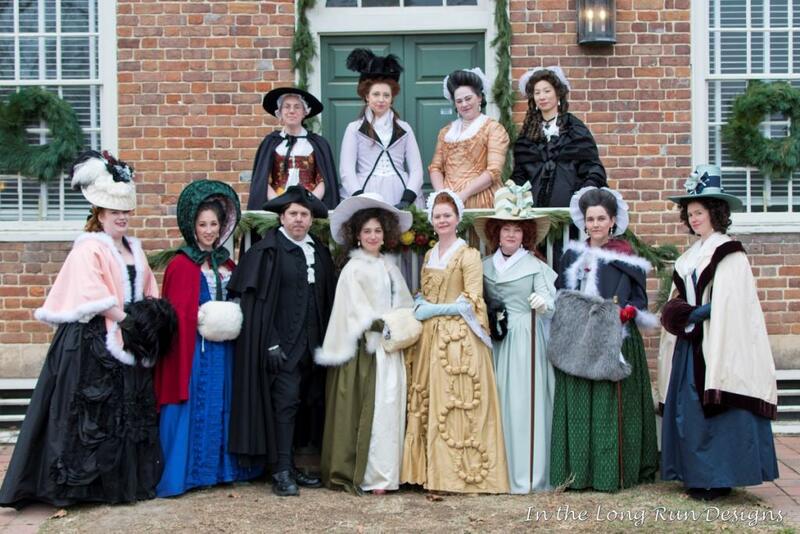 A couple groups of friends decided to get together there to take in the holiday decorations and sport our 18th century winter wear. *Note*: all watermarked photos are courtesy of In the Long Run Designs – thank you again Gloria & Mike!! 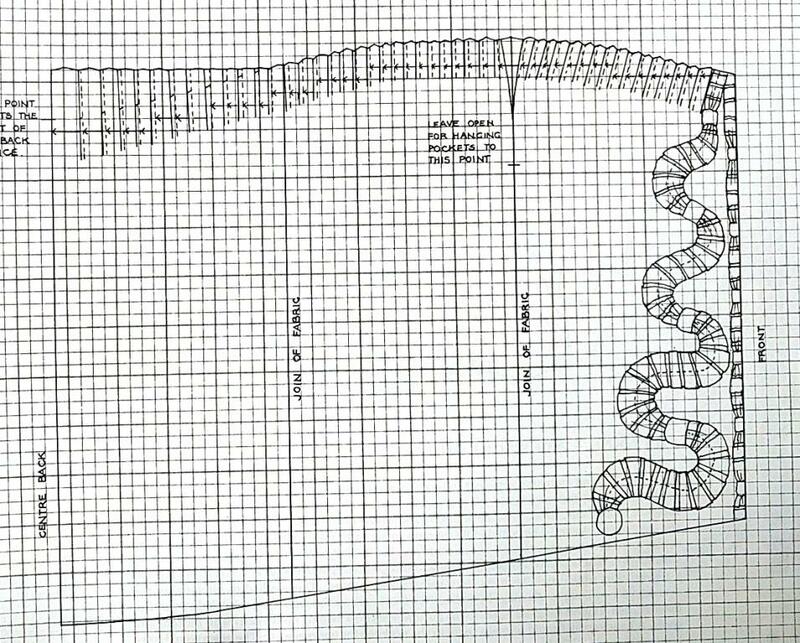 This is something I had planned/wanted to make for some time – basically ever since I bought the fabric a few years ago. It’s a scrummy silk taffeta in irregular micro-stripes of light robins egg blue and ivory and I the moment I saw I had late 18th century visions. In fact, I loved it so much that after first buying 6m of it I went back to the store (it was on sale at Fabricland) and bought the rest of the bolt for a total of about 12m! I had actually seen one (or two) other such dresses in-person in the UK as part of my research so I knew it wasn’t a complete one-off-outlier and I think it’s just such a neat twist on the en fourreau style I had to have it! 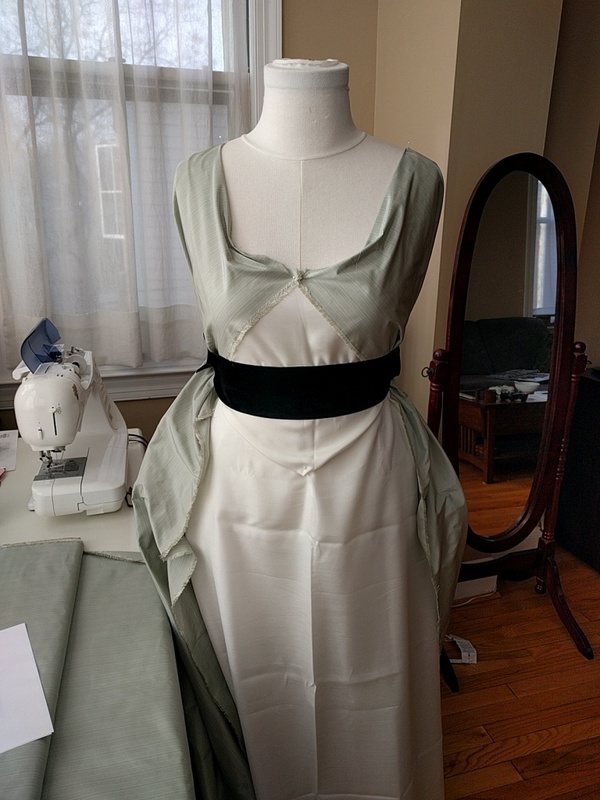 I was also keen to try a cutaway front bodice (often referred to as a “Zone front” but as that’s a modern term I try to stay away from using it) and so put all of these elements together in one dress. 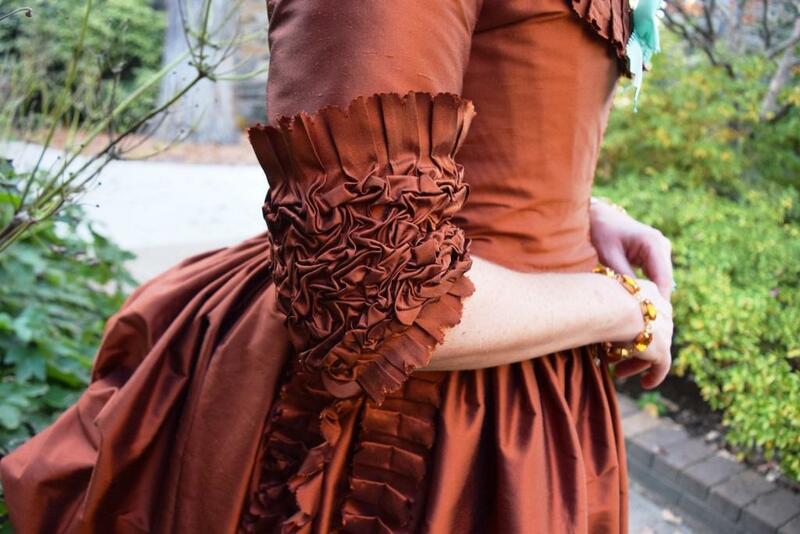 I’ve finally gotten around to doing a sort-of how-to post on the ruched sleeve cuffs of my rust 1780s Italian Gown. This is very far from an authoritative description or tutorial as it was entirely trial and error, my own cuffs are far from perfect and I didn’t have a full tutorial in mind when doing it. 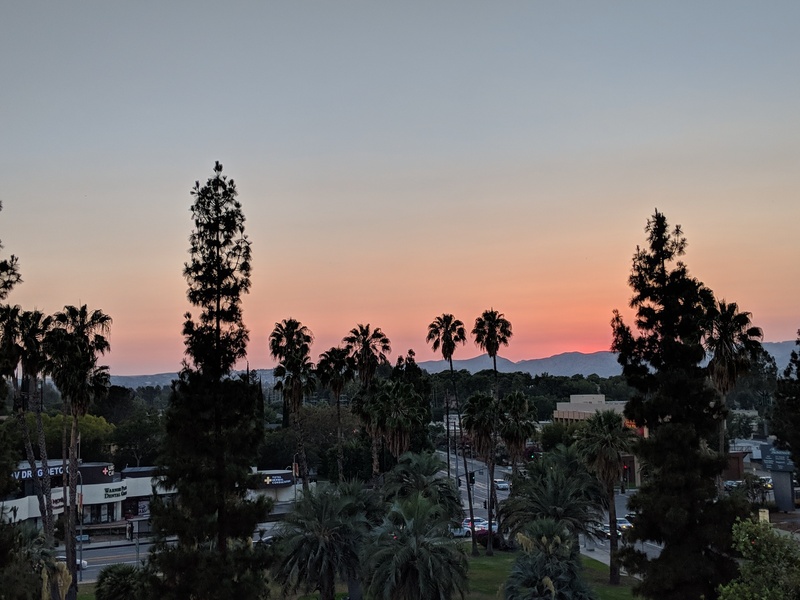 But, hopefully it can somewhat helpful to people and it would be awesome if it was a starting point for someone to come up with a much better and more comprehensive how-to! 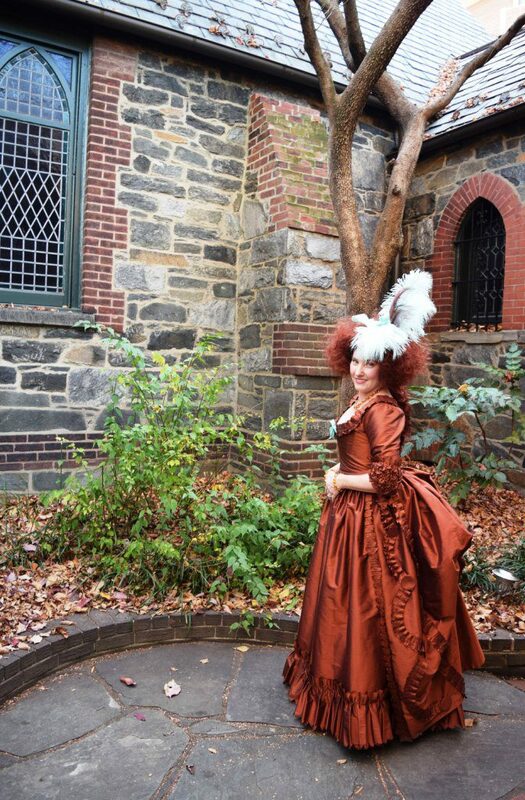 The reason for doing one of these now is another Gadsby’s Ball on November 12 that’s 1780s-themed. Hooray for not being Regency! As much as I love it, I’m getting Regency-d out. 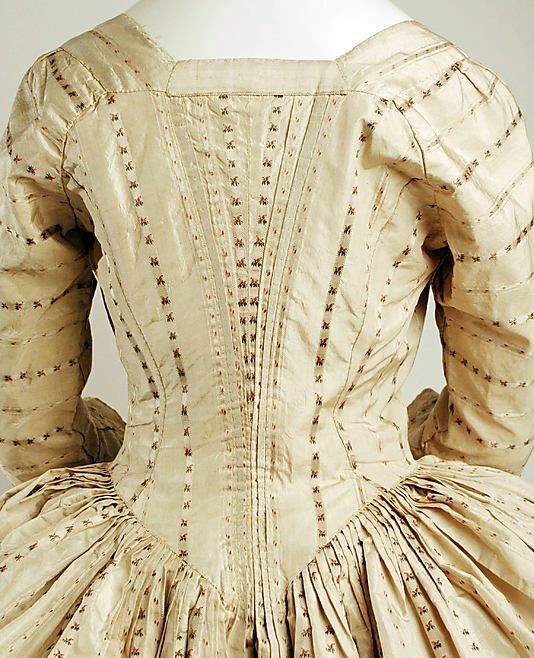 Most of the balls around here have been for that period over the past year and I recently finished a c.1800 ensemble I still need to post about, so I’m very ready to do something different. I’m pretty excited since I’ve never done 1780s before! Bring on the pouf! 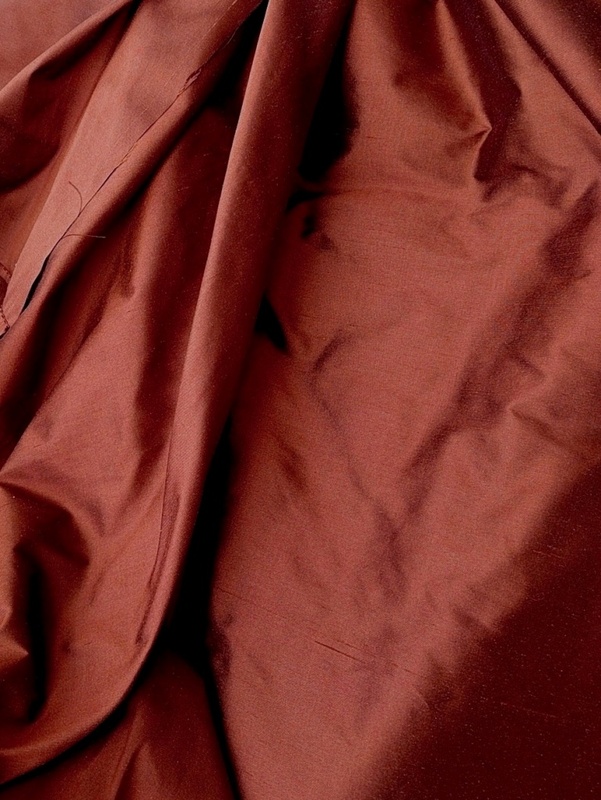 Anyway, my fabric for this is an iridescent rust silk shantung – a very smooth one. I bought it from Fabricmart during one of their silk sales wherein it was described as silk taffeta and looked very smooth in the photos. 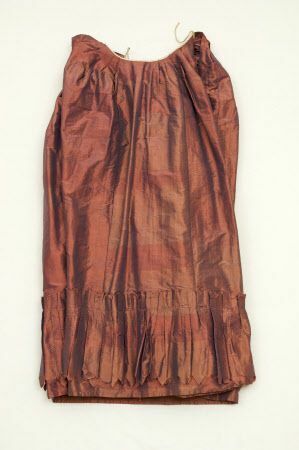 When it arrived I discovered it was actually shantung – a very smooth one, but nonetheless not taffeta. This had happened once before with a silk purchase from them so I sent them an email to let them know there was an issue. I didn’t ask to return the fabric because it’s gorgeous all the same but wanted them to know it made me wary of ordering from them in future. They sent a kind reply saying they’d gone back and amended all the relevant listings on their site and sent me a $10 gift certificate by way of apology. So, that’s a long-winded explanation for why I decided to just go ahead and use shantung for this instead of actual taffeta. It’s pretty scrummy, shantung-ness notwithstanding. 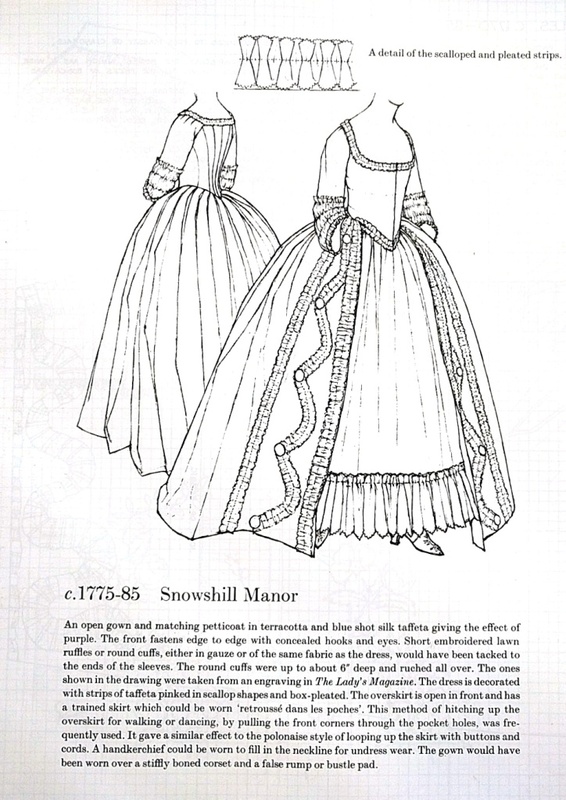 The main one is this 1775-85 gown in the Snowshill collection (now at Berrington Hall). I’ve done research there, pity this one wasn’t on my radar at the time to check out in-person.